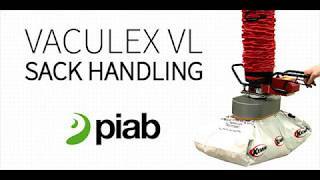 Regardless of what they are made of – paper, plastic, fabric – or what they contain – flour, sand, pharmaceutical ingredients – almost all sacks are handled with ease with the help of Piab's ergonomic Vaculex® vacuum lifter. 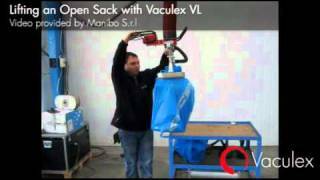 No more heavy, manual work such as lifting sacks for stacking on pallets, emptying into hoppers/feed stations, or feeding /loading/palletizing directly into or from a production line. Save your back - let the vacuum lift the sack! More than one third of all workplace injuries are caused by manual handling. 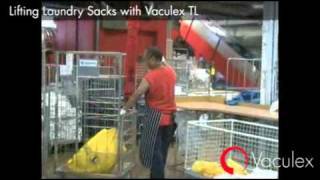 Yet processing staff are still often expected to lift sacks weighing 25-50 kg [55-110 lbs], risking developing musculoskeletal disorders (MSDs) such as pain and injuries to spine/back and shoulders, and repetitive strain injuries. 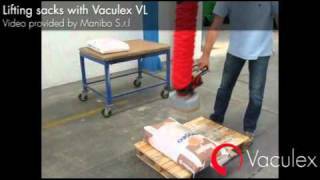 Piab's Vaculex® vacuum-lifting solution is ergonomic, flexible and reduces the load on your body by more than 80%. Thus, minimizing strain injuries, back pain and sick leave, whilst increasing efficiency and user happiness.